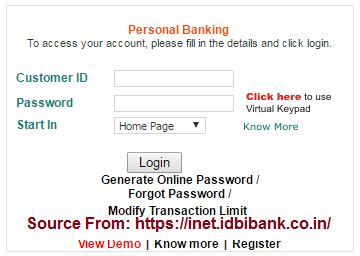 Some of the steps following on how to signup for IDBI Bank Online Banking Creation Account for New Individual User instructions are as follows…. It is redirected to another URL: http://www.idbi.com/idbi-bank-internet-banking.asp#how and it can be opened in a Pop up Window. Coming to the below of that page. You can See “How to Apply” heading. Under that heading you can press on “Click Here” link. And take a print out on A4 Paper. Fill it as per guidelines like Write your Customer ID, Account Holder Name, Debit Card Number, Date of Birth, Mobile Number, Email ID etc. Then give the filled application to your nearest IDBI bank. After the activation you can get Username and Password to your Registered Mobile Number within the bank.